Once you get over the horrible post-baby hormonal 'ugh they're growing up too fast' phase you start to get excited about who this baby might be. Then you forget about that and realise they are contrary little buggers and will be completely different every day depending on their mood and you just have to sit it out. I'm lucky, Ned is usually charming and cuddly and generally a delight. He is also a splasher. I don't know why this is a surprise - he's always loved kicking in the bath but when we first went to baby swimming it soon became clear that unless I was going to let him splash the water with both hands all the time he would get upset and scream. Rather than it being a lovely bonding experience where I got to meet other mums it is now a sodden ordeal where I stand at the back of the pool by myself getting soaked and trying to hear what the teacher is saying over the squeals of delight coming from Ned as he drenches us both. The other mums look serene by the end... I look like a drowned rat. Concealer was first on the list (I stupidly thought I could get away with smudge-proof mascara, waterproofs slightly gentler cousin) and Make Up For Ever seemed to be the recommended brand of choice. Full Cover isn't quite as full-on as the name implies. 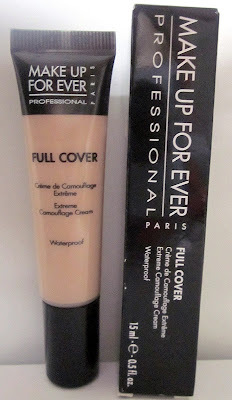 I'm happy to go without foundation but I do like to have a bit of coverage under my eyes and around my nose and this does provide the perfect level of coverage for what I need. I am quite dark under the eyes and this works to conceal the worst of it - I was expecting something really thick so I was really pleased this was much more buildable than I'd imagined. It lasts fantastically and really does survive the drenching I get in the pool - I haven't tried it full on swimming but I think I actually get wetter going with Ned than I do when I go to do my old lady lane swimming. In fact, waterproof or not I really like this concealer but, as with a lot of Make Up For Ever products the price is a little eye watering - £23.15 for 15ml but for reliable waterproofing it is worth the money and you shouldn't need to use too much. It is incredibly blendable though so best to apply it with a brush so you can get the coverage you want and need exactly where you want it without blending it out too much.